Maz Jobriani reads his hilarious and moving memoir of growing up Iranian in America and the quest to make it in Hollywood without having to wear a turban, tote a bomb, or get kicked in the face by Chuck Norris. 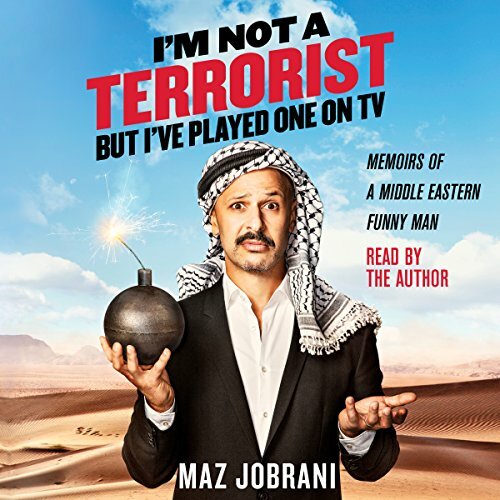 When he first started out in show business, Maz Jobrani endured suggestions that he spice up his stand-up act by wearing "the outfit", fielded questions about rising gas prices, and got called an F'in Eye-ranian for being involved in the Iran hostage crisis even though he was only eight years old at the time--in fact these things happened so often that he began to wonder: Could I be a terrorist without even knowing it? Having emigrated with his family to the U.S. during the Iranian Revolution, Maz spent most of his youth desperately trying to fit in with his adopted culture, whether that meant learning to play baseball or religiously watching Dallas with his female relatives. But none of his attempts at assimilation made a difference to casting directors, who auditioned him only for the role of kebab-eating, bomb-toting, extremist psychopath. In this laugh-out-loud memoir, Maz shares his struggle to build an acting career in post-9/11 Hollywood, from playing a terrorist on 24 to playing a terrorist opposite Chuck Norris to his mother asking, "Vhy you alvays terrorist?!" (Followed by, “Vhy you couldn’t be doctor? !”) But finally, through patience, determination, and only the occasional unequivocal compromising of his principles, he found a path to stardom. And he learned the proper way to die like a bad guy on TV. Not bad, could be more of it. The British comedians are better all round. He at times simply was not funny. But not a bad effort. Very funny and entertaining! I really enjoyed learning about Maz and getting an inside look on the life of a comedian. It's narrated in his voice too so his personality comes through even more. Recommended! What did you love best about I'm Not a Terrorist, But I've Played One on TV? Have you listened to any of Maz Jobrani’s other performances before? How does this one compare? I've heard some of his standup and thought that this would be funny but it wasn't that great. It was his life story that he tried to make sound good, but I didn't laugh too much. Could you see I'm Not a Terrorist, But I've Played One on TV being made into a movie or a TV series? Who should the stars be? The title should have been "my autobiography ". He talked more about himself and his family which is not full of fun and I just wasted my money on this audiobook. The jokes he mentioned here has been aired before in you tube, nothing new. But he's not a narrator either. His points are valid, we should not judge by ethnicity and we should live by the golden rule. But other than that, the book is sort of blah. I expected more laughs from a comedian. I expected more Hollywood inside stories from an actor. What this is really, is an autobiography of an immigrant child raised as an affluent American, mostly preaching against stereotyping, without much passion. Perhaps it is really there but it was lost in the delivery. Hilarious & Thought-Provoking All At Once! I've been a fan of Maz's ever since I saw him on "Friday After Next" as the owner of the "Holey Moley Donut Shop" and was pleased as punch to see that he had not only written but also recorded a book. For the most part, it was funny as hell, but it was quite thought-provoking in others - especially when the topics of ethnicity and religion came up. All in all, it's a great listen and is worth every penny! Definitely got my money's worth! loved the book! having met him in Dubai a few years ago this book gave me a better understanding about the man, never fails to make you laugh and one neck of an actor. Mr. Jobrani's works should be required reading in every high school. The world would be a better place! Beautifully narrated, insightful, humorous, and touching. I recommend listening to this book to anyone who has an interest in learning more about the middle east through humor.